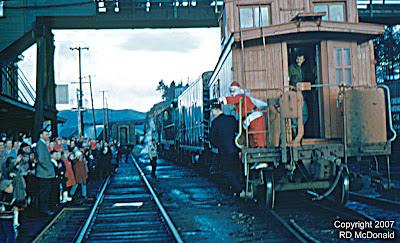 Christmas in Prince Rupert, 1958. With horns blaring, bells a ringing, and red signals showing, Santa Clause arrives to the delight of a cadre of children in Prince Rupert. GMD GP-9 4807 and GMD GP-9 4411 along with a steam generator car, and Santa's caboose pull into town on a cold, wet and windy day before Christmas! Hard to believe another year has slipped beneath our bows. It seems like the older I get the quicker they pass. The corollary being, the less I remember of what transpired! During my Christmas vacation in 1958, I managed a cab ride on the log train up to Terrace. The plan was to stay overnight with a buddy of mine, and hitch a ride home on the westbound passenger train Sunday evening. There had been quite a snowstorm, and the Skeena River was beginning to freeze over. It was a beautiful ride. Just before lunch, we arrived at the Kalum Log Spurs, the big re-load facility where entire bundles of logs, over legal for highway transport, made a comfortable load for the empty log cars. While we’d experienced occasional snow flurries it had stopped by the time we got to the reload. I watched as the head end brakeman made his way to the front of the locomotive. He turned, backed down three steps and stepped off into a pile of snow up to his armpits! I’m sure he could hear the roar of laughter coming from the cab! A Jordan Spreader had preceded us by about an hour, and had curled just enough snow to make things interesting for that poor fellow! 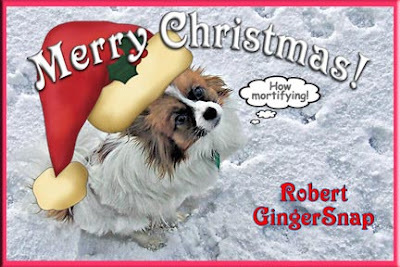 My office Manager GingerSnap and I hope you enjoy a nice holiday season. Sometimes life isn’t fair as far as the human condition goes, but we should all strive to do the best we can with whatever hand is dealt us. ● The first piece of attention grabbing information was, that people shy away from Surveys. Only 18 readers responded. This over a period when almost 3,000 readers logged on. ● While 50% expressed an interest in railroading and other transportation modes, only 21% were actively involved in railroad photography. From my perspective, when you have only a handful of Class 1 Roads running in the US, the diversity has been greatly diminished. Wonder how many guys have shot each others recent photo op as the locomotive crosses the country! ● Fifty-six percent of responders, when asked about Internet participation, said they were just lucky to be able to turn computer on. Never mind write a blog or fiddle around with a web site! ● More than 25% of our readers found the inclusion of hyperlinks of little or no use. We include hyperlinks (the red underscored words) to link to expanded detailed information on our topic. The function serves another practical purpose. I can share a page or photo with you without the hassle of contacting the site owner for permission to use materials. ● We were gratified to see the “Railroad Stuff” proves to be of interest to more than 80% of our respondents. Sometimes it can take days of painstaking work to track the lineage of a locomotive. And like me, I feel you are interested in learning where the unit ended up. ● Ease of reading was rated only fair by 6% of readers. But when I look at the ratings for “font size,” “font readability” and “page layout” it may be that I should pay more attention to sentence structure or complexity. ● Almost one-quarter of readers expressed concern about photo sizes. 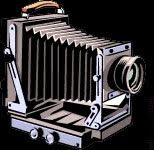 I must confess certain wariness about being “ripped off.” Although one wag said, “if you don’t want to loose it, keep it off the Internet!” Twice I’ve found my photos on someone else’s site, with my identification erased. In one case, the individual came close to loosing his blog. Google responded quickly, once I produced evidence of ownership. At this point, I know a lot more of the mechanics behind "Blogger by Google." I now know how to adjust elements of the blog page. Making the reader column wider won’t make past photos bigger. They were scanned for a column width of 500 pixels. Moreover, a column width of 500 pixels is an ideal "reading width." You can read the complete results of our First Ever Oil-Electric Blog survey by clicking on the portable document file logo below. Included are the “written” comments of survey respondents not discussed here. So when all was said and done, an overwhelming 94% of respondents rate “Oil-Electric” as an “excellent blog” that they have bookmarked and have recommended to others. And that’s a great Christmas present. Thank You! Union Pacific Railroad 142B. Argo Yard Seattle, July 27, 1961. Well, here is another unit destined to be a follower, never a leader! Always hooked up with an "A" unit, the first thing a rail photographer sees in the view finder! Electro Motive Division manufactured 165 "GP-9B" units for several roads between February 1954 and December 1959. 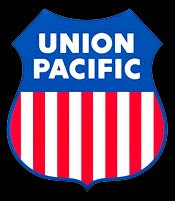 Union Pacific Railroad purchased 75 of these units, beginning with UP 130B ending with 204B. "GP-9 B" units were often created following a wreck or other misadventure, sometimes by the railroads own shops. They eliminated the need for control stand electronics and air brake systems, cab seating, and other amenities associated with an "A" unit, excluding a toilet! The downside was that most railroad photographers shunned the "B" unit, focusing on the "leader" "A" unit, be it cab or, in this case, road switcher "B." However, they failed to acknowledge that you cannot run a "B" unit on the head end of a train! Railroad Stuff. UP 142B, EMD 567C 1,750 hp, built February 1954, sn: 19218. Weight 122 tons. Sold to Precision National Corp., Mount Vernon, Il., in September 1976; sold to ICG, rebuilt to ICG chopped nose GP10 8304, completed on 25 August 1977; sold to VMV; sold to US Army 4608 in February 1992. Apparently now in the US Marine Corps! Marine Corps Logistics Base Barstow located in Yermo, California. My roster information is getting a little dated on this unit. If you can provide current information leave a note in the "Comments" section below! Port Townsend, today. This is the time of year when folk begin scrambling around looking for a calendar or two for next year - the year of the Tiger. Well, you're right, the Year of the Tiger won't start 'till what - February? I can remember when my late wife and I used to hit Powell’s Books in Portland Oregon every Christmas. They had an entire floor dedicated to calendars. We’d end up with one for every room and a bunch for Christmas presents. As kids, my buddies and I would take the bus to downtown Seattle, and hit all the travel agencies and railroad ticket offices up on 5th Avenue. Northern Pacific occasionally issued a poster size railroad calendar. I had four of them at one time. Who knows were they ended up! Pan American World Airways and American Airlines had pictures of aircraft landing in exotic places we could only dream of visiting. And they were great calendars too. 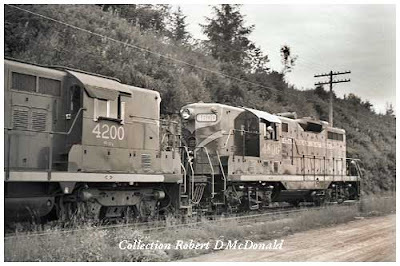 I have a few Kinsey calendars featuring geared locomotives in the Great Pacific Northwest. To image that fellow tramping through the woods with his wet plate camera! Like a National Geographic Magazine, one never considers throwing away a Kinsey calendar. The absolute worst calendars were the Rexall Drug Store and Bartell Drug Store calendars, with pictures of pills, wheel chairs and bunion appliances. The calendars that got prime posting sites in our home were the Foss Tug & Barge and Puget Sound Tug & Barge calendars. They competed every year, with solid offerings. And both featured the squiggly lines of the tide tables with precise phases of the moon. Share with the rest of the audience your calendar story in the “Comments” below! So here at Oil-Electric, we thought we’d give you an early Christmas present. It will become an instant collector’s item, because we’ve never done it before, and I don’t plan on doing it again! 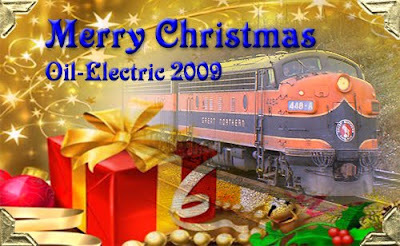 Click on the calendar icon at the top of the page for your Collector’s Edition 2010 Electric-Book calendar. Notice! It is a high-resolution .pdf file, set to print at 300 dpi, so load your photo quality glossy paper. The file size is 1,147K so it may take a moment or two to down load, but your patience will be rewarded! Two or three times a week I scan through the “Worlds Biggest Photo Posting” web site, looking for something new, something different, something exciting in an otherwise vast barren wasteland of GE toaster ovens. I enjoy the occasional steam, and definitely the first and second-generation diesel shots, and the photography of Jean-Marc Frybourg, of Paris France. 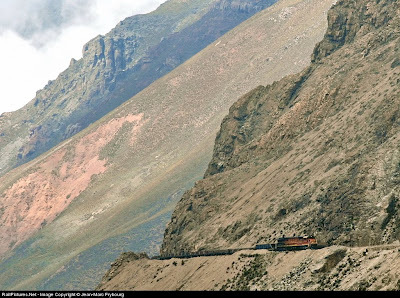 When you first read the narrative, it is interesting to note that this is a standard gauge railroad operating General Electric C30-7M’s, down in the Peruvian Andes, running in absolutely spectacular scenery, and this train is climbing through an elevation of 14,700 feet heading for Galera at 15,675 feet. There is some serious railroading captured here! Think about it. 14,700 feet and still climbing! That is incredible! Let’s put this in perspective, to grasp the intensity this photograph captures! The author shooting Mt. 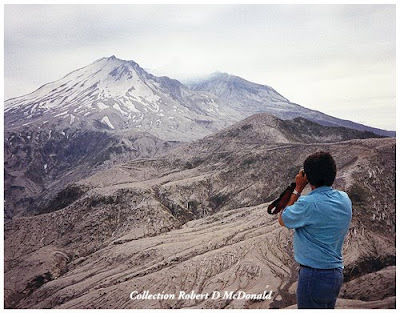 Saint Helens in 1983. Reduced to a mere 8,363 feet following the 1980 blast. Still have to go up more than a mile to be at the elevation of Jean-Marc's photo! With the exception of Denver and a few other elevated towns, the majority of us in North America live in a narrow band ranging from sea level up to 3,500 feet. Flat Landers visiting Denver notice something different is happening with their breathing, at a mere 5,000 feet. And if you did the Interstate 70 to get to Denver from the west, you passed through the Eisenhower Tunnel. At 11,158 feet, the Eisenhower is the highest motor vehicle tunnel in the world. I remember my van struggling to get through the Eisenhower! Years ago, Freightliner built a fleet of souped up Cab Over’s for Coors – the Powerliner. They moved the goods for Coors so well that drivers had to be careful not to rear-end conventional trucks crawling over the summit! Heck, even the Siskiyou Summit on I-5, only 4,310 feet, can take the pizazz out of the family bus. 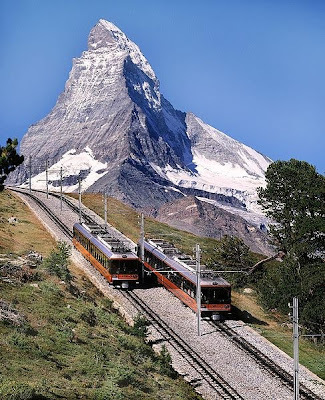 The famous Matterhorn, at 14,692 feet, closely approximates the elevation of Jean-Marc's photos of the train passing through 14,700 feet! Not only internal combustion engines begin to wheeze at elevation. Above 8,000 feet, humans begin to experience mountain sickness. By the time you get to 14,000 feet, you are in a danger zone, where the atmosphere is about 40% of down here by the bay. 40%! Without supplemental oxygen, at this elevation humans become susceptible to a handful of maladies, none of you would be anxious to repeat, such as High Altitude Cerebral Edema (HACE), which causes the lungs to fill with liquid. For the technically inclined: “When engines are operated at higher altitudes, i.e., at a low barometric pressure, lesser amounts of air are introduced into the cylinders, causing the air-fuel mixing process to deteriorate relative to lower altitude, higher ambient pressure environments. This combination of factors increases untimely and incomplete combustion in the engine cylinders which lowers fuel efficiency and increases exhaust emissions of CO, PM, and smoke. The reduced amount of air for the fuel-air mixture combustion, together with the increased untimely combustion, typically leads to increased cylinder exhaust gas temperatures. While this article is a few years old, it worth the read if only to understand why these trains are running up to the roof of the world. A reprint from Issue 14 of Latin Tracks, March 2004 details the FCCA. The Ferrocarril Central Andino (FCCA) is one of two separate rail operations in Peru. Railhead is at the port city of El Callo, running some 110 miles to Galera. 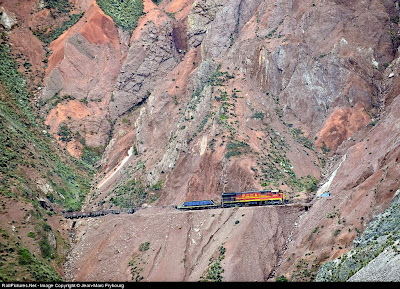 In those 108 miles, there are six switchbacks that limit train length to 18 cars, 4% grades, 69 tunnels, 58 bridges, and an elevation gain of 15,000 feet, making it the second highest railroad in the world. The highest railroad in the world opened in 2005, when China began operation of the Qingzang Railway in Tibet. The highest point being Tanggula Pass at 16,640 feet, 837 feet higher than the FCCA. The locomotives are fitted with oxygen supplies for the crew. There are several good videos of the FCCA on YouTube, allowing us to some – eh – high adventure, including an interesting look at how to end-for-end a C30-7M! You can view all of Jean-Marc's photos at Railpictures. Enter his name in the photographer's search engine. This is the rail tour Jean-Marc is in the midst of! 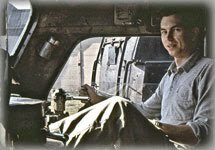 Our thanks to Mr. Frybourg for sharing one heck of an interesting Arm Chair Adventure with the readers of Oil-Electric! August 14, 1960, Auburn, Washington. Here we find a raving beauty, Northern Pacific 2152. She is a “Pacific” class locomotive, 4-6-2, Road Class Q-3. She was built by Baldwin Locomotive Works in March 1909, and assigned boiler number 33277. The Northern Pacific Railroad donated her in 1958 to the City of Auburn. Static displays are a wonderful way to preserve history. In some environments, such as the Willamette Shay on display at Railroad Park Resort in Dunsmuir, California, you can enjoy a hands-on experience, and climb up in the cab. The locomotive is out in the open in a "real life setting," posed with a water tank. But she is in a protected environment, next to the manager's office inside the motel grounds. On the other hand, displays in a public park like the NP 2152 is pictured in, are often the target of vandals. Look carefully at the number board on this engine, and you will see a glass segment has been hit, possibly with a rock. Even more disturbing are the acts of ill-mannered so-called rail fans, who think they need to take home more than a photograph! So up go the hideous chain link fences. Static displays are expensive to maintain. Remember, when these engines were in service, they had constant daily maintenance. So, when budgets get tight, some static displays, like the Great Northern engine that had been on display at Woodland Park in Seattle, end up being scrapped. Fortunately, the NP 2152 lives on! In 2006, when the City of Auburn announced they wanted to get rid of her, she was snapped up by the Northern Pacific Railway Museum in Toppenish, Washington. 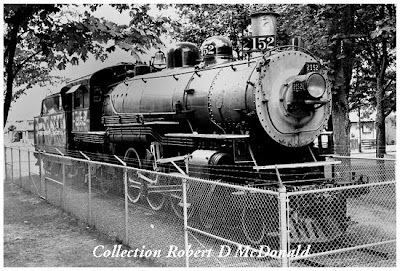 Canadian Pacific Railway, Port Coquitlam, BC, July 4, 1961. My buddy El Purington and I have ventured north across the border to do some train chasing. Like Seattle, Vancouver was a cornicopia of diesel delights: Canadian National Railways, Canadian Pacific Railway, Pacific Great Eastern, Great Northern, and Pacific Coast Terminals. Heading up the Fraser River, our next stop is Port Coquitlam. Port Coquitlam is located on the confluence of the Pitt with the Fraser River. 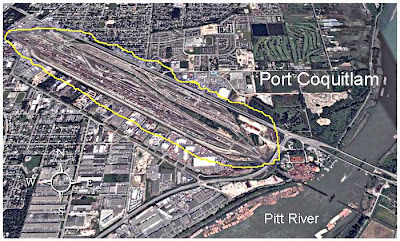 At that time she boasted the largest Canadian Pacific Railway yard in BC. 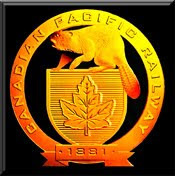 The Canadian Pacific Railway moved its freight operations from Vancouver to Port Coquitlam in 1911. The city was incorporated in 1913. The name “Coquitlam” comes from the First Nation’s Salish word 'Kwayhquitlum', meaning red fish in the river, referring to the river’s annual salmon spawning run. 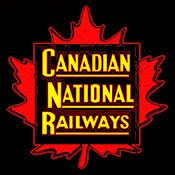 It's interesting to note the operational differences between the Canadian National and the Canadian Pacific. While the CNR ran their Geeps long nose forward, rigged up with home-brew ditch lights, the CPR, running in the same dangerous Fraser and Thompson Canyon countries, ran short nose forward without ditch lights. 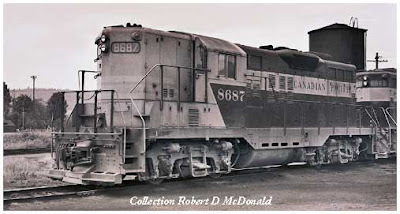 Railroad Stuff: CPR 8687, GMD GP-9, built London Ontario, 9/57, sn: A-1143, road class DRS-17d. Apparently sent to Ogden Shops and rebuilt as a GP-9u, chopped nose and remote equipped in 1984, but I cannot verify. If you have information you care to share, please including that in the comments box below.